I recently booked a last minute trip to Menorca. An absolutely stunning little island apart of the Balearic island trio. It was a spur of the moment kinda thing, those trips often end up being my favourite. I saw cheap flights and accommodation, so thought, why on earth wouldn't I? It's been an island I've only recently been attracted to earlier this year, from friend recommendations telling me how glorious the water is out there. I'm a sucker for clear waters you see! It's all a bit mesmerising when you see water so blue. The past few trips I've been on this year have been jam packed press trips, so I was keen to take a moment for me. It's important we let our hair down every once and a while. Forget about the things we 'need' to do, and take a moment or two to soak up some time for ourselves. But, how do we just "live in the moment?" Isn't it scary that we have to ask ourselves how to just live sometimes? Somehow, we've been programmed to be constantly thinking about what's to come in the future, or caught up dwelling on the past. As Oprah Winfrey once said, "Living in the moment means letting go of the past and not waiting for the future. It means living your life consciously, aware that each moment you breathe is a gift." the sooner you learn how to live for the moment, is the moment your life changes forever. After taking this trip away for a few days, I feel re-inspired, rejuvenated, more aware, and physically pumped for life in general. The time I have spent solely on myself and the company I'm spending time with, makes me excited to get home and create something good. I'll be honest though, I can never fully switch off during a full trip away. It's engrained in me to create new content often. I couldn't resist not video-ing or photographing in the beautiful places we explored in Menorca, but I love it, and it's a hobby I'm fortunate to call my job! Whilst I'm away travelling for myself, I love to experiment with my style a little more. I feel that when I'm at home, I can sometimes get into a bit of a routine with my outfits, especially when I'm working from home on a daily basis... there's days where I don't even bother to get dressed! Dressing up in new summer pieces is always fun, and this time round I had a case full of Accessorize goodness I couldn't wait to style up. I find that styling just kind of 'flows' - & I feel that most when on vacation. Holiday fashion is my favourite fashion. Unplanned outfits are my favourite kind of outfits. The best thing I love about Accessorize, is that whatever I throw on of theirs, it just works. All of the pieces are so unique, though really work well together. One of my favourite pieces from Accessorize this season is the scarf necklace - though, you'll see in my outfit photos I've styled this in a couple of different ways in 2 outfits. It's main purpose is to be wrapped around your neck as a gorgeous embroidered choker, though I couldn't help but want to try it around my head as a head scarf. I absolutely love multi functional pieces, it makes the investment more worthwhile if you know you can play around with it in different ways. On holiday I love to be in loose clothing, something that allows me to be free, but also looks good at the same time. I brought three, free flowing dresses (tongue twister!) along with me on this trip, they were perfectly suited for the hot weather in Menorca! Especially the beach throw over, which is made up of an incredibly light weight fabric which makes it easy for the body to breathe in. 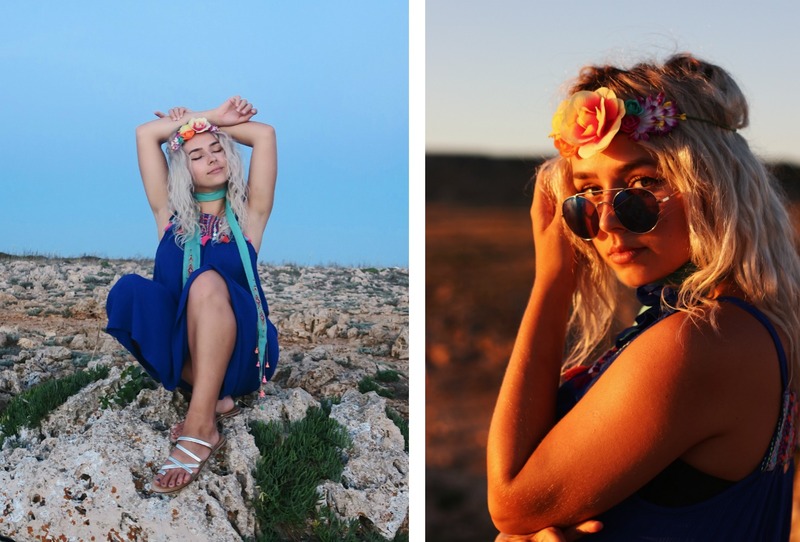 I'll be releasing a mini holiday look book of all of the styles I wore from Accessorize in Menorca over on my YouTube channel, though if you haven't already, head over to my Instagram to catch my holiday snaps wearing Accessorize! *This post was sponsored by Accessorize. All wordings and opinions are my own. I never shop in accessorize! I'll definitely be popping in store next time I'm by one!